(Newser) – It's not quite the leap from an 18th-century atlas to Google Maps, but it's close. The Verge reports scientists from Washington University in St. Louis have created a new map of the human brain that includes 97 areas never before identified. They published their findings Wednesday in Nature. A professor at Yale calls the new map—which Wired says "sort of looks like a page from an adult coloring book"—a "huge leap in neuroscience." The map gives new detail to the cerebral cortex, the outer layer of the brain responsible for motion, senses, emotions, and problem solving. 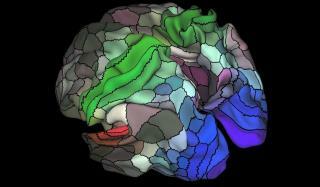 Scientists hope it will help clarify how different parts of the brain impact human behavior, Popular Science reports. For example, researchers could use the map to find what areas are different between the brains of people with and without learning disabilities. It should have one more added AREA of the HUMAN DUMOCRAT BRAIN! The part that tells them that... HIL(LIAR) Will Promise Everything your LITTLE DUMOCRAT SHEEP VOTERS Heart desires if U vote for HIL(LIAR) To get to the WH! Meaning LIE,CHEAT & STEAL her way to the POTUS! Also those that follow a PATHLOGICAL LIAR like HIL(LIAR) Have No Soul,no Morals,no Shame, No Character and NO INTEGRITY! In that DUMOCRAT SHEEP VOTER BRAIN! There ya go ALL! "i'm sorry i punched you in the nose. my neurons must be misfiring."